Even fashion has a cycle and it repeats itself. In the era of sleek, light, speedy and fuel-efficient two-wheeler’s, the orchestra of the Royal Enfield made a silent return. It is again in vogue and its glamour has not faded even after a generation abandoned it. 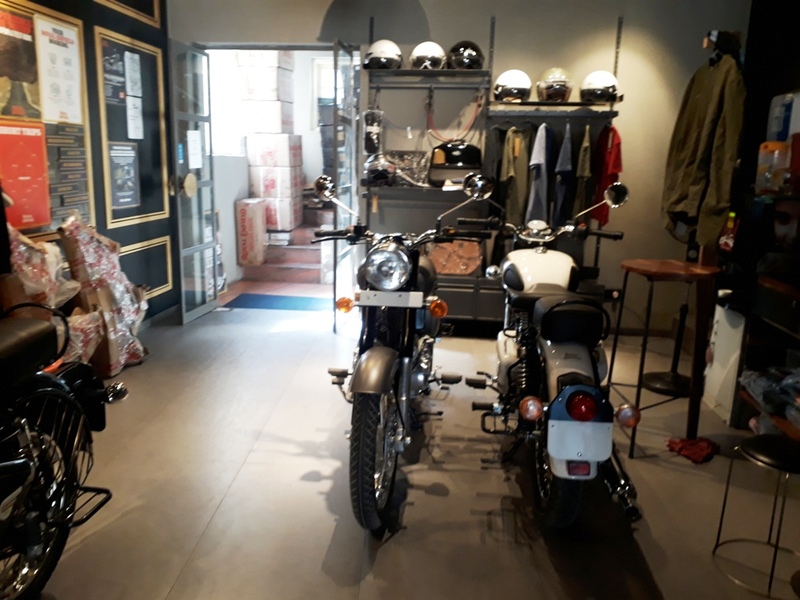 It was purely the demand that now Srinagar city has its own Royal Enfield outlet. Fayaz Ahmad, 50, once a two-wheeler spares dealer is now Managing Director of PCS Automobiles. Earlier, his shop at Batamaloo was perhaps the only address for Enfield owners for repairs and spares. He was having the monopoly in handling the Royal Enfield bikes. The soaring demand led him to open a showroom that is now a one-roof solution to everything. Enfield is the middleweight champion, with engine sizes ranging from 350cc to 535cc. Fayaz said it took him two years to complete the process of registration and setting up the showroom. It started formally in 2011. In 2009, Fayaz approached the Royal Enfield Company and discussed the possibilities of an outlet. He got a letter of Intent (LoI), following which he was called for an interview at Chennai. Later, after the site visit, they were convinced that the Nai Sarak Habba Kadal being in the heart of the city is a good location. Fayaz is personally a passionate Enfield rider. He has a Thunder Bird and has travelled several times from Srinagar to Delhi on this. 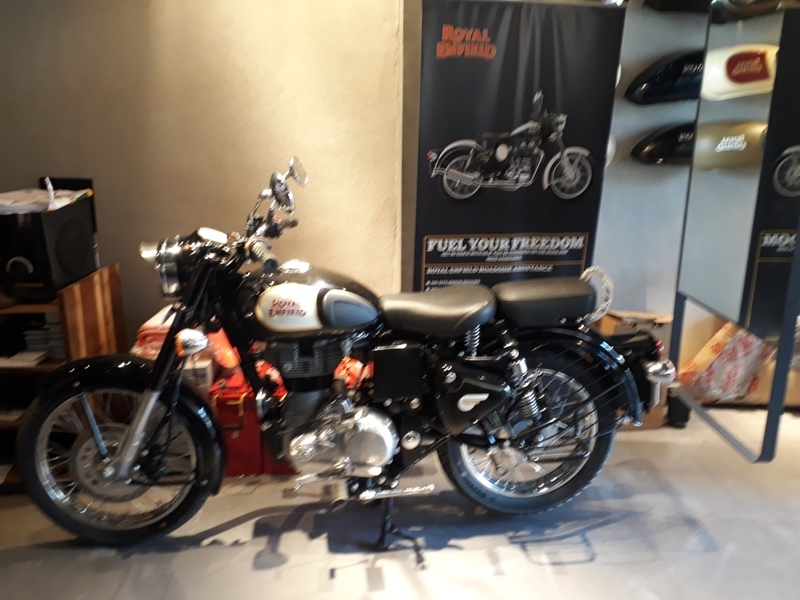 “It was also my dream to open a Royal Enfield showroom in Srinagar because this machine has attained that cult status over the years and its popularity has only increased among people,” Fayaz said. After the site, the real job of constructing the showroom started. In between came the 2010 unrest but he used every single day to put in his best. Finally, the showroom was opened in October 2011. So far, 200 bikes of different variants were sold, every month. ”The demand is so huge that the customers have to wait even three months after booking to get their bikes delivered,” Fayaz said. Encouraged by the response, now Fayaz is opening a new show-room at Lasjan By-pass. Certain models of the Royal Enfield are very popular in Kashmir: Classic, Thunder Bird and Himalayan. The craze and popularity for the Royal Enfield are so much among the people that the private clubs have come up. They provide bikes for rent to the people. Basharat Ayaz, 28, a businessman had his Kashmir Bikers where he would offer bikes on rent for people on an exploration trip to the state, mostly to Ladakh. He now has a fleet of 53 Royal Enfield bikes. “People especially who travel to Ladakh love travelling on the Royal Enfield bikes. It is the best bike for the terrains which are hilly and rough,” Ayaz said. Ayaz says that these bikes are very reliable and do not break easily on rough roads. It has diverse colours. “Now, new models have come up with new features like the Himalayan variant has a swing rod which keeps its equilibrium on the hairpin road bends,” Riyaz Ahmad, a mechanic who repairs bullets at the service centre, said. Two wheelers have made entry into the state quite fast. With every passing year, the new models are jumping into the market. Off late, the government is funding the scooty’s which it routinely gifts to the girl students who make it better in their classes. The government has converted this into a full-fledged scheme with proper budgetary allocations. But not everybody is so keen to have an Enfield or a Bullet. These machines are for a small section of youth who have money and want to make a statement. With the affluence growing, this small section of exclusive two-wheel riders is gradually improving the numbers. Riders have barely started feeling the thrill of riding the high roads with big machines.